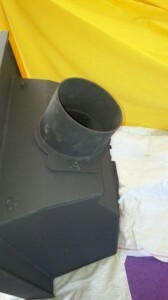 The stove collar is removable and in the pic above is set so as to keep the flue pipe vertical above the stove.. 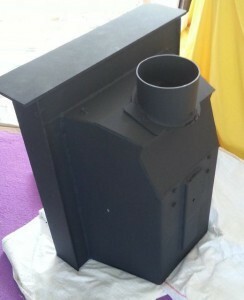 Note that on this model the stove collar can be rotated so that it aims backwards 30 degrees. This is extremely useful as it means that the flue pipe can be aimed backwards to miss the lintel (invariably the lintel is directly above the collar). You can see on this picture how the collar is attached to the stove, by two bolts from inside the stove (you can click on the photo to enlarge). Even now you can see that even with a 30 degree elbow the adaptor will only just clear any lintel. 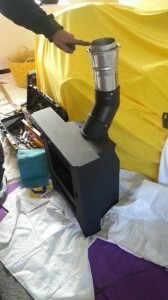 The pic above shows a long-nosed adaptor connected, using metal-to-metal self tappers, to one 30 degree elbow which is in turn connected to the stove. 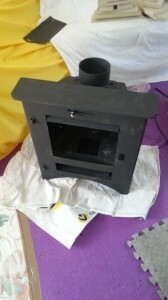 I then unbolted the collar from the stove and connected the top of the adaptor to the liner when it was dangling in the fireplace with the elbow and collar attached and then pulled the liner up from the chimney so that the liner, adaptor, elbow, collar all dangled inside the chimney just above the fireplace opening. In this picture you can just see the collar peeking from the chimney – the hammer is just wedging the collar out of the way for whatever reason I cannot remember. You can see that we are creating a layer of bricks to raise the inset off the ground. In this case this was because otherwise we would have a gap above it (you cannot go lowering lintels when you have fancy brickwork). The base is now completed (layer of Hardiebacker concrete board on bricks for base all mortared in of course). Note that we screwed Hardiebacker to the side walls and top as well. This was to make the recess exactly as required in the fitting instructions. 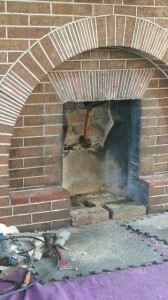 You can also see how we had to cut some of the fireback away. Next the stove was slid into the recess until the flange touched the wall. From inside the stove it was possible to grasp the collar and bolt it in. Two Thunderbolts allowed the stove to be screwed deep into the fireback and/or floor from within the stove. 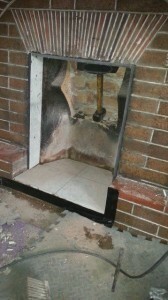 Vermiculite was poured down the chimney to insulate the stove rear so all the heat is thrown forward into the room. Voila! The finished item. Every stove is different, so read the fitting instructions. Sometimes one screws the stove to the floor via the inside of the stove, sometimes through the back of the stoves (Thunderbolts are great for this). Sometimes the stove manufacturer wants the stove body back-filled with Vermiculite, sometimes not. 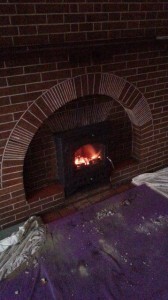 Read the fitting instructions, in fact download them before buying the stove is the way to go.